Let's get some admin stuff straight first: The Bloodline Feud is a re-release. It's actually the combination of two previously released books, The Family Trade and The Hidden Family. The Merchant Princes series is six books, but they've been re-released as a trilogy (as Stross originally intended) with each book now containing two of the previously released titles. The Bloodline Feud is the first of the re-released trilogy. In The Bloodline Feud, we meet Miriam Beckstein, a biotech reporter who immediately loses her job for uncovering a story too big to handle. After visiting her adoptive mother, she finds a pendant in her biological mother's belongings that allows her to travel to another Earth. This Earth, however, never left medieval society, and she's the long lost daughter of a countess, and niece of a powerful duke. She is, more or less, lost royalty with more money and power than she'd ever had in the mundane world. Her collective family are known as The Clan, and they are world-walkers. They've established a base of power in the medieval world through mercantilism, importing and exporting goods between Earths. However, not everyone is thrilled to see Miriam, as she and her line of the family were suspected dead for so long. She has enemies inside The Clan, enemies outside of The Clan, and another mysterious faction that also poses a threat. Among these, she must conform and navigate the social world of this alternate Earth, and she's not quite sure she's willing to give up the comforts of the Earth she has known for so long in exchange for palace politics, reduced agency, and near-limitless wealth. 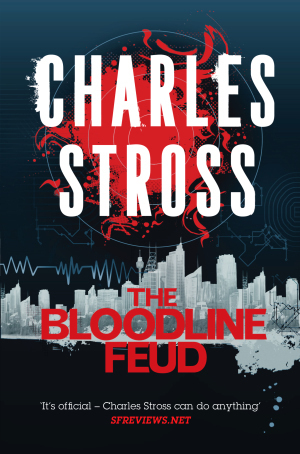 Of the Stross novels I've read, The Bloodline Feud is the least fantastic. World-walking is tantamount to magic, but this story has a lot to do with how Miriam rejects the majority of medieval life and the family trade (hence the first book's title). She's an independent, strong-willed woman who doesn't see the benefit in exchanging even her mediocre life in the modern world for an arranged marriage and the life of royalty. However, none of this is particularly boring because it's well paced. Miriam's life is threatened on a number of occasions and the palace politics approach the machinations of a Song of Ice and Fire novel. What I described before is largely the beginning of the first book, and the second book introduces a twist into the story. It takes the book into a fairly interesting, if a little predictable, direction. While the point of view largely follows Miriam, there are the bits and pieces of other peoples' perspectives as needed to inform the reader of things Miriam cannot know. Again, these are well placed and keep the story interesting to read. Unfortunately, the characters are fairly flat. Miriam and her mother are interesting, but the rest hold no secrets (even the ones who do hold secrets from Miriam) and do nothing unpredictable. The story also happened to vomit out the most interesting parts at the very last 50 pages. It wraps up with plenty of unresolved matters (expected, because it's part of a series), but it also glosses over some significant events. Getting closer to the ending, I knew it was not going to put a bow on every plot string, but I expected some of the more significant events to get bit more gravity. I also found it fairly odd that more than enough time is spent in the beginning to describe Miriam's current occupation, but that mostly goes to hell in the first 100 pages, and it's brought up again maybe five times over the course of the rest of the novel. I guess it gives background to her actions but there's not much use for a biotech reporter in the medieval world, and her strength's don't seem to rely upon that background. Sad to say, though I enjoyed this book, it is probably the weakest I've read from Stross. It's got an interesting hook, but perhaps it is a bit too long. The two books combined suffer, where a solid break between them might have been more appropriate.